Victorian Crazy Quilting was extremely poplular and reached it's Heyday circa 1885. However, these quilts were made from 1880 until the late 1890's. 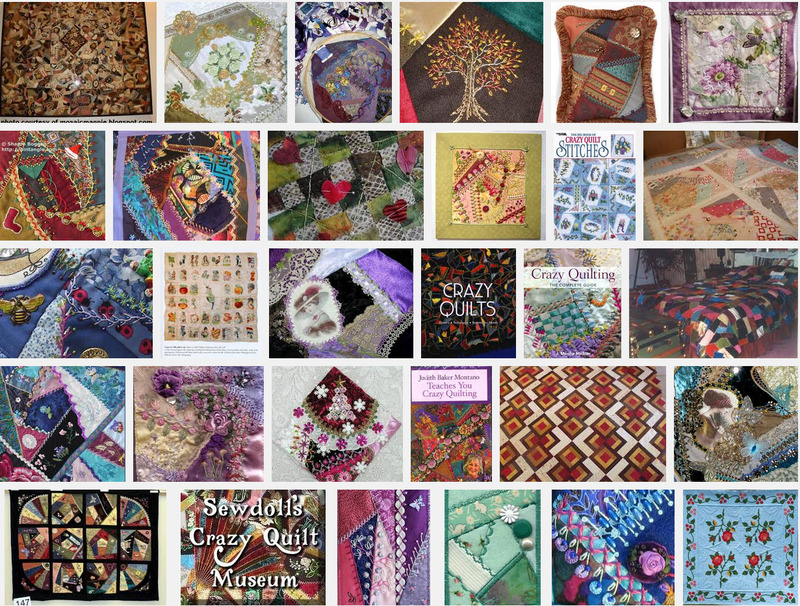 A Crazy Quilt is a patchwork quilt put together like a jigsaw or broken pottery. The more embroidery, motifs and beads to hide the seams the better. The wealthy craved them and often the ladies who did not have to work would sometimes spend years creating their quilt or parlor throw just to show off their embroidery skills with some of the worlds most expensive fabric and silks. The fad soon caught on with the poor. By collecting and using scraps from family sewing projects and inexpensive mail order fabric ends they were able to create their own quilts relatively inexpensive. Some were thought to believe that embroidering a spider and web onto the quilt was good luck and if good at painting, they would show off their skills with painted pictures or stencils onto the fabric. Often family history or verses would be embroidered onto the quilt making these precious quilts family heirlooms. Now, that wonderful Victorian pastime is enjoying a resurgence in popularity.